The PolyBiogas is a contentious digestion system commercially sold in Kenya. It's trial stage was financed by IFAD (International Fund for Agricultural Development) and implemented by Cypro East Africa. It's development goes back into 2012. 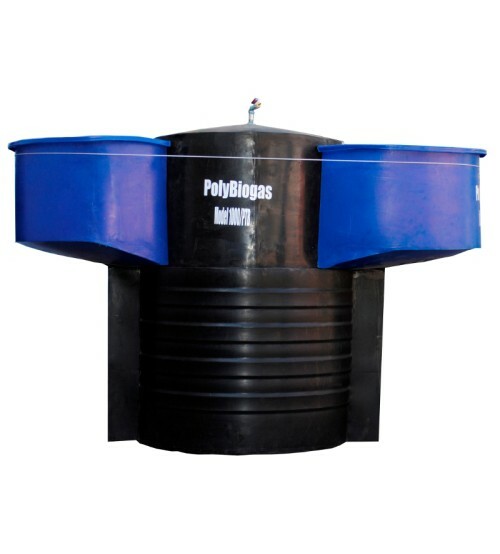 Cypro approached Polytanks Ltd, manufacturer of HDPE products to develop a biogas digester. The biogas system uses a 1 m³ AD tank combined with and gas storage tank of 0.35 m³. The inlet and outlet tank is designed as a displacement tank. Both displacement tanks are above the water line making it possible to slightly pasteurize the gas. the digester is designed for being partly below ground. The recommended feeding rate is about 10kg dung per day mixed with 10 litres of water. the polybiogas PTB1500 is not contentious from my point of view. additionally, it's development was not financed by IFAD of the UN. It was designed by Cypro East Africa collaborating with Polytanks Ltd while IFAD of the UN came in to support the evaluation trials for the digester. IFAD supported five (5) evaluation trials just after the digester was manufactured. why do you think it is not continous. You feed it on the one side and the fertilizer comes out on the other, or do you empty the whole system out and start again?